Open-internet advocates continue to battle on the federal and state level. The U.S. Senate voted on Wednesday to save net neutrality, marking only the second time Congress has taken any significant legislative stance on the contentious topic. The largely symbolic 52-47 vote in the Senate, championed by Democrats, pushed forward a resolution of disapproval under the Congressional Review Act that seeks to reverse a decision by the Federal Communications Commission to undo tnet neutrality rules put in place by the Obama administration. Three Republican senators broke party lines to vote for the resolution: Susan Collins of Maine, Lisa Murkowski of Alaska and John Kennedy of Louisiana. The resolution now faces an uphill battle in the House, where Republicans have a strong majority, and even if it passes there, it would still require the support of President Donald Trump. The first vote on internet traffic regulation came in 2011 but did not end up going beyond the Senate. 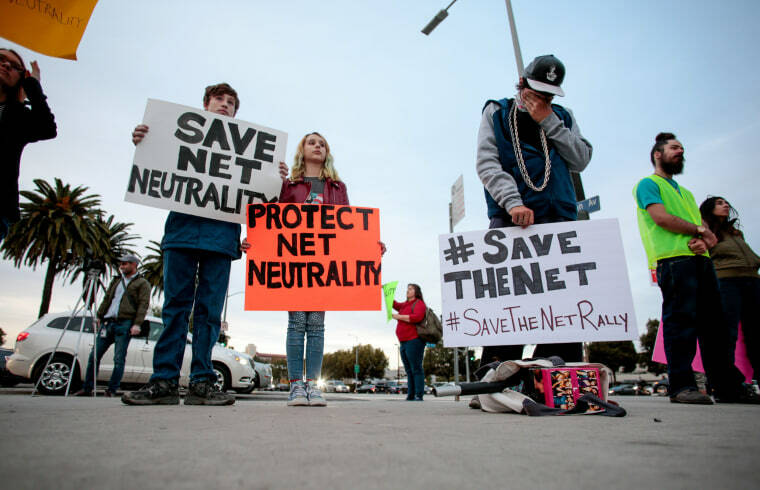 The last-ditch effort comes just weeks before June 11, the date designated by the FCC as the end of rules on net neutrality, the idea that all material on the internet should be treated equally and access should not be restricted or favored by internet providers in any way. The issue has split members along party lines, though some Republicans, including Sen. Susan Collins of Maine, have voiced their support for net neutrality. Supporters of the FCC repeal believe the new “light touch” rules set to take effect next month offer more choice for consumers, allowing them to pay for more tailored internet packages to meet their needs. Net neutrality supporters have argued that the Obama-era protections are necessary to protect consumers from “unfair” practices, including blocking websites, throttling traffic and engaging in paid prioritization, which allows an internet provider to favor one site over a competitor’s or offer better access to companies that pay for it. I just talked to a colleague who told me that phone calls were running 6,000 to 10 for #NetNeutrality. It is working. The Senate vote is a hard-fought victory for net neutrality supporters despite the unlikelihood that the resolution will pass the House. Many popular websites and companies, including Twitter, Etsy and Netflix, support net neutrality. Even if the resolution dies in the House and the repeal takes effect, net neutrality is still showing signs of life at the state level. A number of states have passed open internet protections, creating a patchwork of regulation in the U.S. that internet service providers will be forced to navigate or potentially challenge at the federal level.